The lower back is a remarkable structure of interconnecting bones, joints, nerves, muscles, and ligaments working together to provide support strength and flexibility to our bodies. However, such a complex structure leaves the lower back susceptible to injury and pain. 1. Put the ice in a plastic bag and place a towel between the bag of ice and your skin. 2. Use the ice for 15-minute intervals every four to six hours as tolerated. 3. After 48 hours, you may switch to using low heat (e.g. a hot water bottle or heating pad), or continue to use ice for intervals of 20 to 30 minutes to reduce pain. Don’t make matters worse! Avoid activities that may worsen your lower back pain, such as sitting or standing for prolonged periods. Gradually increase your activity level as you are able. You may also alternate rest with exercise, household chores, and other daily activities. If your job requires lifting heavy objects, sitting/standing for a long time, or other activities that may worsen your back pain, it may be helpful to ask your healthcare provider about a referral to an occupational therapist. An occupational therapist can show you techniques to reduce stress on your back. 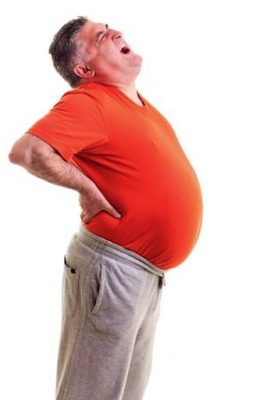 People who are overweight are known to be at greater risk for back pain, joint pain and muscle strain than those who are not. As such, it is important to maintain a healthy weight, so that no additional strain and pressure is added to your spine. 4. Sleep on a firm surface. Sleep on your back on a firm mattress or carpeted floor, with a pillow under your knees. Alternatively, you may sleep on your side in embryo position, with your knees bent. You may also place a small rolled towel in the small of your back for support. Coco Chanel once said, “Keep your heels, head, and standards high.” However, if you’re susceptible to back pain, it might be best to keep your heels low. This is because your body compensates for the off-balance heels cause by flexing or forward bending the hips and spine, which causes excessive muscle fatigue and strain for your calves, hip and back. If wearing high heels is a necessity for you, consider stretching your leg muscles before and after putting them on, or try to set your limit to two inches or less. You may also consider varying your footwear from day to day. 1. RafflesMedicalGroup. (2018, June 28). Care of Low Back Pain.